Don’t know if I’ve mentioned it here before, but pigeons are my favourite birds, and I do mean the ordinary kind, commonly seen on our streets. I’ve been a bit distressed, or maybe jinxed, this week because there are two dead pigeons on my walk to the bus stop. But today I had a cheerful pigeon moment: I was walking through the shopping precinct in Stockport, and noticed a bus heading along the road about to run into two rather slow-on-the-uptake pigeons. But the driver slowed down and they had the chance to fly away. I’m glad about that. Another thing making me happy is the darning on the Make do and Mend bag. There was a point, about a third of the way in, when it seemed to be all wrong. Now, with just under a quarter left to go, I’m loving the way it looks. Progress has been made on the stash busting project, too. A friend at the office needed a little red riding hood costume, and took a sizable weight of red fabric off me to make one. Yay! The guild meeting last weekend was really good. Angela did another button workshop, and despite having missed the materials list at last month’s meeting, I made this rather spiffy fabric button. 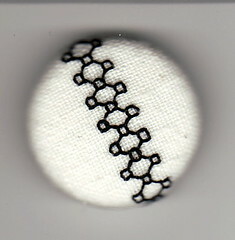 The embroidery was done in the blackwork workshop, and it had just been hanging around in my embroidery bag since then. Lucky for me, it was the perfect size to fit the plastic snap together buttons that Angela was demonstrating. Super easy. She pointed out that a button is an excellent way to show off a small bit of embroidery, something like a practice piece that worked out nicely. Must say, she’s absolutely right! It's a bigger project than I thought it was going to be, and I have a feeling it will just drag on and on. Back to happy notes (sorry, this post is getting to be like the Sound of Music): my lunch today was cereal in a bento box. Yogurt, milk and raisins in one part, wheat flakes and flaked coconut in the other. Worked well and was very tasty. Now, off to watch Ponyo.